We’d love your help. 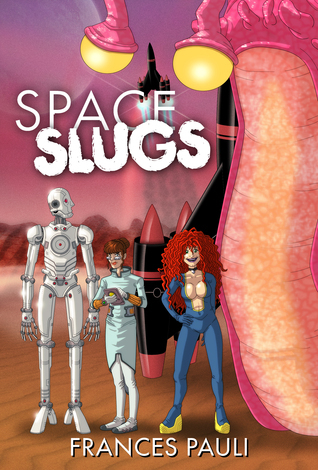 Let us know what’s wrong with this preview of Space Slugs by Frances Pauli. When Murray receives another phony wedding invitation from her galaxy hopping sister, Zora, she hops the first flight to an obscure planet at the edge of the civilized universe. But instead of a wedding, Murray finds her sister imprisoned by an alien overlord. With the assistance of a mysterious android and the universe's last living space slug, the women end up the run in When Murray receives another phony wedding invitation from her galaxy hopping sister, Zora, she hops the first flight to an obscure planet at the edge of the civilized universe. But instead of a wedding, Murray finds her sister imprisoned by an alien overlord. With the assistance of a mysterious android and the universe's last living space slug, the women end up the run in a stolen space ship with half the galaxy in hot pursuit. Thanks to Zora, it's the least desirable half. Maybe Murray will get lucky, and the crash landing will kill her. To ask other readers questions about Space Slugs, please sign up. Am surprised to report that I quite liked this story. It was fun, light-hearted, and original. I also suggest an editor - a human one this time - go over the dialogue structure. Too many times it was unclear who was doing the talking. Such confusion on the part of readers interrupt Am surprised to report that I quite liked this story. It was fun, light-hearted, and original. I also suggest an editor - a human one this time - go over the dialogue structure. Too many times it was unclear who was doing the talking. Such confusion on the part of readers interrupts a story's intended flow and rhythm. Merely correcting the paragraph breaks, punctuation, and he-saids, she-saids would address that problem. Apparently, there is a sequel to this book, titled Slug Opera. While I'm disinclined to buy that book, I am curious to know if its dialogue indicates improvement and how the story ends. Dr. Murray is on her way to her sister's wedding. Never mind that this is the umpteenth time her sister has planned a wedding or that she's written help me on the bottom of the invitation, Dr. Murray takes it all in stride. So she's a bit nonplussed to be locked in the dungeon when she arrives at the place where the wedding is to take place and has her sister for company. Thankfully, she manages to escape with the help of an android that is more than he seems and a wedding present that ends up b Dr. Murray is on her way to her sister's wedding. Never mind that this is the umpteenth time her sister has planned a wedding or that she's written help me on the bottom of the invitation, Dr. Murray takes it all in stride. So she's a bit nonplussed to be locked in the dungeon when she arrives at the place where the wedding is to take place and has her sister for company. Thankfully, she manages to escape with the help of an android that is more than he seems and a wedding present that ends up being a gooey and growing space slug. Space Slugs is a fun and wacky story that takes the reader from one place to the next in a plot that expands like the universe, ever outward. While the story doesn't always flow smoothly from chapter to chapter and I would have liked a bit more description, there were plenty of sarcastic twists and turns to keep the plot moving. This is one of my favorite books on my (kindle) bookshelf. I don't even remember why I got it originally but I love it. The characters are fun and the book just makes you want to keep reading to see what happens next. It's not quite a romantic sci-fi since there isn't that much romantic-type action, but it is there in the background. This is a fun read for those who just want something light and new. I thoroughly enjoyed it and am keeping my eyes open for all of Frances Pauli's books. Just so yo This is one of my favorite books on my (kindle) bookshelf. I don't even remember why I got it originally but I love it. The characters are fun and the book just makes you want to keep reading to see what happens next. It's not quite a romantic sci-fi since there isn't that much romantic-type action, but it is there in the background. When you start reading Space Slugs, you may find it hard to stop. And once you reach the very first introduction of an actual space slug, you'll be hooked. What can i say? It's a light-hearted read with sub-plots to make some soap operas jealous. The fun the author had in writing this come sthrough straight away. While there are certain things I would ahve liked changed, both for personal and non-personal reasons, in the grand scheme of things, Space Slugs, in either this or the unedited, seriali When you start reading Space Slugs, you may find it hard to stop. And once you reach the very first introduction of an actual space slug, you'll be hooked.